Through 19 November 2016, the Ullens Center for Contemporary Art (UCCA) presents Zeng Fanzhi: Parcours, the artist's largest and most comprehensive exhibition anywhere to date and his first institutional solo show in Beijing. Including nearly sixty works borrowed from collections around thé world, it covers nearly thirty years of Zeng's creative output, winding through his extensive stylistic and thematic evolutions on canvas and in sculptural form. The main body of the exhibition in UCCA's Great Hall features key works from each major series in Zeng's career, presenting a complete picture of his creative exploration and artistic contribution, and referring to art-historical precedents from Hellenistic sculpture to Lucian Freud. It culminates in a room dedicated to a recent series of works on paper—never before exhibited in China—which mark a new engagement with the aesthetics of Chinese painting, and in the Nave, where a special space has been constructed to show two of his most substantial landscapes. 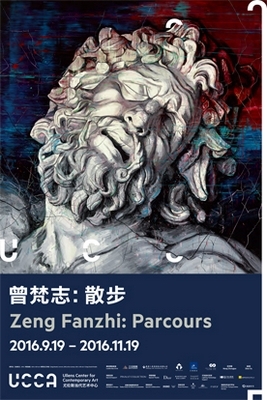 Its title inspired by that of an early painting he completed in 1990, "Zeng Fanzhi: Parcours" offers to bring the viewer along on the artist's creative journey. A key figure in the generation of artists who emerged, along with the very notion of "Contemporary Chinese Art," onto the world stage of the early 1990s, Zeng Fanzhi has consistently used his works to reflect on the social and cultural climate of his country through a highly personal visual language. His early paintings, completed during the late 1980s while he was a student at the Hubei Institute of Fine Arts, combine the pedagogical apparatus of socialist realism with a romantic interest in Western classicism and modernism to depict new realities of Reform-era Chinese society. Following his arrival on the Beijing scene in the early-1990s, Zeng Fanzhi quickly gained recognition for his "Masks" series, which gives symbolic form to the dichotomies and affectations of that era through figures in varying states of alienation. After this, Zeng Fanzhi continued his research info painting itself, producing the strikingly colored, tensely vibrating, monumentally scaled canvases of the "Abstract Landscapes" series. In recent years, he has combined the free-range brushstrokes of these landscapes with homages to works by masters including Leonardo DaVinci and Albrecht Durer, in a series of seven four-by-four-meter paintings that have been extensively exhibited abroad. The newest works in this exhibition consist of a grouping of paintings in ink on paper which signal an introspective shift in his practice. Today Zeng fulfills a role inhabited by artists throughout Chinese history: an aesthete among the worldly, offering uplift and solace through refinement. Its design carefully authored by the artist's longtime collaborators Tadao Ando Architect & Associates, "Zeng Fanzhi: Parcours" rhythmically divides the expanse of UCCA's Great Hall into an immersive survey of his career. Six freestanding walls, each punctuated by a 2.4-meter square window, thoughtfully connect major shifts in the artist's practice. They are enclosed by a series of darker walls that run around the space's perimeter, chronologically presenting portraits from ail phases of Zeng's career. Having sought to avoid enclosed spaces, Tadao Ando has likened this layout to sections of an MRI scan that allow viewers to walk through layers of the artist's mind. UCCA Director and exhibition curator Philip Tinari states, "UCCA is hugely excited to be presenting Zeng Fanzhi's most comprehensive exhibition to date anywhere in the world. His singular painterly vision connects his personal experience of living in contemporary China to centuries of artistic creation across many cultures, as art becomes a vehicle for exploring history and articulating taste. This exhibition offers not only an overview of his considerable talent, but a meditation on the importance of aesthetic cultivation in a messy world." Regarding his survey, Zeng Fanzhi states, "Fortunately, I encountered painting in my youth and chose to embark on this creative path that now stretches for nearly thirty years. Along the way, I have discovered a place I call my own, where art serves as a guide through the long corridor of history, allowing one to traipse freely through time and space. My heart is filled with gratitude for the wonderment of this experience, and I hope by presenting this exhibition, which incorporates canvases from ail the major shifts in my practice, to share a fantastic visual journey with a global audience."